From the first human settlements to the latest marine explorations, The golden shore tells the tale of the history, culture, and changing nature of California’s coasts and ocean. Author David Helvarg takes the reader on both a geographic and literary journey along the 1,100-mile Pacific coastline, from the Oregon border to the San Diego/Tijuana international border fence and out into its whale-, seal-, and shark-rich offshore seamounts, rock isles, and kelp forests. Part history, part travelogue, part love letter, The golden shore tells the story of California’s majestic coastline and ocean. Helvarg captures the spirit of the Californian coast, its mythic place in American culture, and its role in a state whose ongoing natural disasters and unremitting sense of renewal are intimately linked to its deep connection with an ever-changing sea. 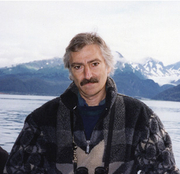 David Helvarg is currently considered a "single author." If one or more works are by a distinct, homonymous authors, go ahead and split the author. David Helvarg is composed of 1 name.